The annual growth rings in timber or lumber that can be seen when the timber is cut across the grain. In old timber framed buildings it is used to date the time that trees were felled, and so the construction date, by a study of the annual growth rings. The pattern of annual rings in a core sample from the timber is compared to known dated samples on various databases. Far more accurate than carbon dating. Trees grow in yearly or annual cycles. Looking at a section cut through a tree it is quite plain to see the yearly pattern of growth and to actually count the rings to determine the trees age. In each year the growth varies with the seasons and spring wood can be seen as wider or thicker and lighter coloured sections than when the growth recedes towards winter. Likewise by looking at the varying yearly growth it is possible to tell good years from bad years. 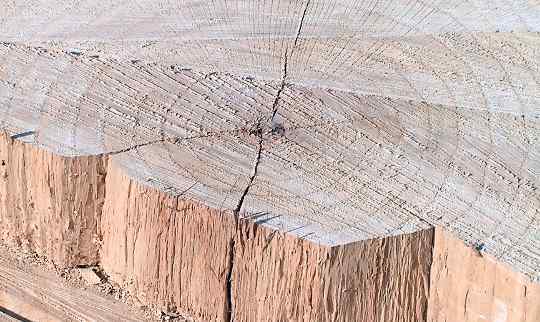 By comparing a section of a piece of timber against various records in a database of section whose ages are known it is possible to accurately date timber from this study of the annual rings. This is the fairly new science of Dendrochronology which has only become possible with the advent of large databases of growh patterns. Hardwood timber grows more slowly than softwood and so the growth rings are closer together than the rings in the faster growing softwoods. Annual rings showing on the end grain of a section of softwood. Photo thanks to Morguefile and bosela.